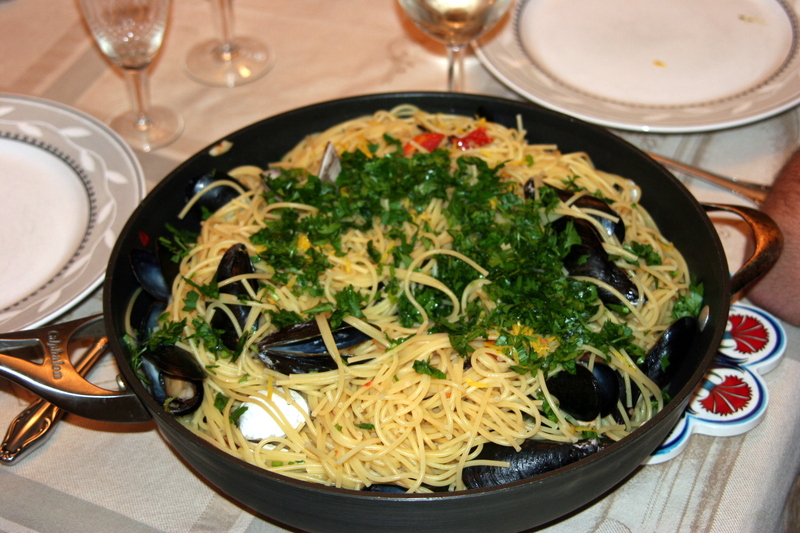 When we were in Greece back in August, my brother spent some time with us near the beach and one lovely summer evening he cooked “spaghetti alle vongole”. Well, “vongole” means clams in Italian and he made it with mussels. So, technically speaking, it’s “spaghetti alle …cozze”. The dish was love at first sight. Comfort food with seashells. Just right for the occasion. Last Saturday we had friends over for dinner. I couldn’t get my mind off that dish and decided to go for a seafood menu. After a lengthy research on the internet, I decided the version I’d try would be with no tomato sauce. I didn’t want to take any chances overwhelming the dish with too heavy tomato sauce which could easily “drown” the taste of the mussels. The dish came out just perfect and it earned its place in mydinnertoday. I hope you enjoy it as much as we did. Credits: I picked the wisdom of Felicity Cloake who tried many different versions of this dish to recommend the version I ended up cooking myself. How to make: Rinse the mussels in cold water, scrubbing them to remove any impurities from the shells. Put them in a bowl and cover them with cold water. Add some salt and leave them like this for an hour or two. Drain and rinse well to remove any sand that may have come out. Cook the spaghetti as per package instructions but be sure to take the spaghetti off the fire couple of minutes earlier than the recommended time. While the spaghetti is being cooked, put half the butter and all of the olive oil in a large and deep pan. Saute the garlic and the chilli. If you don’t have chilli, add some red crushed peppers right after the garlic has softened. At this point, I added the sun-dried tomatoes. Time for the mussels! Add the mussels all at once. Add the wine, cover the pan and wait for a few minutes until most of the mussels have opened. Be sure to discard all closed mussels. You can remove the shell from some mussels and leave others with the shell for variety. Drain the spaghetti and add it to the pan. Add the butter and toss well. You can keep tossing the spaghetti in the pan for a minute or two to allow it to absorb the taste of the mussel sauce. For this reason, it is important that you cook the spaghetti less than the recommended time. They will need the extra minute in the pan with the mussels. Add the lemon zest and juice. Take the pan off the fire. Add the parsley and serve. Notes and tips: When I went to the market to buy mussels, I also found clams. I decided to take a big bag of both mussels and clams. However, the mussels opened much faster than the clams so I ended up removing most of the clams. Lesson learned. No mixing of the two or steam them open in different pans and then combine them.